Whenever someone mentioned to Ninh Binh, most of people will think about Trang An Complex, Bai Dinh Pagoda – the largest Buddhism pagoda in Vietnam, Tam Coc, Hoa Lu – ancient capital. Even you had one full day trip to Ninh Binh before, I still believe that most of you never heard about Dancing Cave – Hang Mua.Dancing cave is located Khe Dau Ha Village (Ninh Xuan Commune, Hoa Lu District). Dancing cave name associated with the legend: the king of the Tran Thai Hoa Lu Am set Vi, King often come here to listen music from beauties, and Harem dance, so the cave was named dancing cave. Dancing cave is located at the foot of the mountain. Shape of this moutain looks like a bell, is about 800 Square Meters. The path to trek up to the yop of this mountain was built modeled on the architecture of the Great Wall of China but the number of steps is much less with around 486 stone steps. There are two way to entre the cave. You can visit Tam Coc by boat and pay a extra fee to require the sampan man to sail to this cave. I will not highly recommend this way to any tourists who never visit Indochina area before because the Sampan man can charge foreign tourist unbelievable fee to visit this cave. Besides, they will not wait for your for a long time to visit all parts of Dancing cave. Another way is drive to the main entrance of Dancing cave and buy a ticket (VND 100.000 per person). Then, you will have more time to discover all at this place. You will feel so wasteful if you pay VND 100.000 and just visit a normal cave. I want to remind that Dancing cave is not different so much with other cave in Tam Coc and Trang An or Halong bay. Besides, with someone, they feel it uninteresting and the price is so much high until they start trekking to the top of the mountain and complete nearly 500 steps. Then, they realize that the view over the countryside from the temple which is on the top of moutain is stunning. It will be an unforgettable memory of your trip in Ninh Binh if you touch the top of moutain at around 5:00pm. On the final part, I will share to you how I will arrange my full travelling day in Ninh Binh. This will be based on my first trip to Ninh Binh 02 years ago. I think that I am a Vietnamese people but my first time will be same with yours. 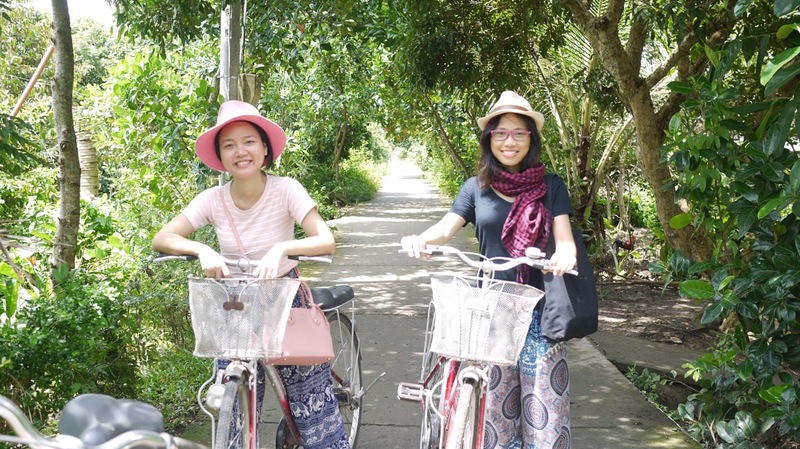 On the first time, I was wondering if I should visit Tam Coc or Trang An because both of them are so beautiful, especially in the paddy season in Tam Coc. After a few days discussing with my companion, I will decide to see both of them and Hoa Lu Temple only on day. In the early morning, we drive to Trang An Complex from Hanoi. choose a private boat for two of us (we are big boys and do not want to share our boat, so we buy 4 tickets for two of us to enjoy Trang An). Remember that if you have much time and will not back to hanoi for flight or anything else, please remind staffs at port that you want to visit all caves and all pagodas in Trang An. The total time for this place is more than 3 hours. We also choose visit Trang An in the morning and end before 11:00am. You can avoid strong sunshine at noon. After that, we drive to a local restaurant near Trang An and enjoy burned rice and goat meat (specialties of Ninh Binh province). Take a rest at restaurant before driving to Hoa Lu – Ancient Capital. From Trang An boat station, Hoa Lu is only a few kilometres further on. After one hours visiting Hoa Lu and learning its history, we drive to Dancing Cave. Normally, you will have to back to Trang An boat station to get to Dancing cave easily by passing Trang An Street. However, we decided to drive to 38B route and this way will be 3km farther than driving back to Trang An Boat station and follow Trang An street. However, I did not want to drive again on one route so many times, so we choose the longest way with 38B route. Besides, the scene on this way is very authentic and peaceful. You will also across Sao Khe river before arriving in Dancing cave. As most of other tourists, we was not impressed so much by the cave but we knew that the most intersting part is waiting for us with completing nearly 500 steps to touch the small temple on the top and enjoy the sunset. We thought that 500 steps would not be a big problems but it was. We start trekking at 3:00pm in summer time (the temperature is 33-36°C) and we had just prepared only 500ml water bottle for two of us when we visited Dancing Cave. I want to suggest that you should bring more water if you want to reach the top because it will be fairly tired. There are some tourists gave up and just stayed at the middle way to take some picture. For us, we never want to waste our money and time for this, so we try to our best to reach the top. The final result is really amazing and can not describe on my words. I hope that my experience and sharing will be helpful and make you a wonderful trip in Ninh Binh with Dancing Cave in your plan. 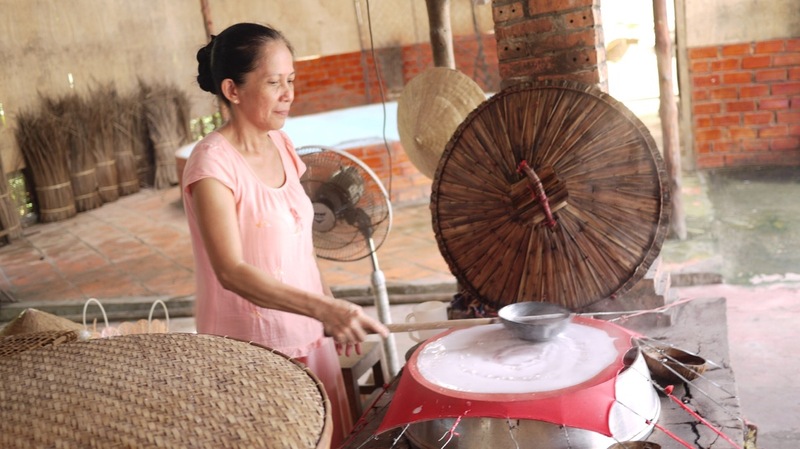 As you know Vietnam is a long history country with diversity in culture, cuisine and religion. For religion, Vietnam will be influenced by China, Indochina region, and Europe, so there are many religion in Vietnam. But, there is a very strange thing that nowadays, 80% of Vietnamese is non-religious and they donot follow any religion totally. However, Buddhism was the first religion in Vietnam and influenced strongly on what Vietnamese people believe and how they live until now. That’s why Buddhism is not our official religion and now, there is not much people following this religion totally but we still have many ancient Buddhist pagodas all around the country. I will list 8 Buddhist pagoda is considered as the most famous pagoda in Vietnam. In the part one, I will introduce 4 pagoda in North Vietnam tours . the Northern Vietnam will cover a half od list because this part of Vietnam is influenced by Chinese culture and belief. Besides, in the past, the North is Buddhist center of the whole country. The temple was built by Emperor Ly Thai Tong, who ruled from 1028 to 1054. According to the court records, Ly Thai Tong was childless and dreamt that he met the Kuan Yin – Goddess of mercy handing him a boy while seating on a lotus flower. The Emperor then married a peasant girl and they had a son. In 1049, he decided to construct a temple in gratitude for this important event. He thought that Goddess of mercy gave his son to his life. At this age, based on Asian culture, a son was very important for all of family, especially for Emperor or Royal family. The pagoda was built in a style of a lotus emerging out of the water as Emperor Ly Thai Tong dreamed . The temple is built of wood on a single stone pillar 1.25 m in diameter, and it is designed to resemble a lotus blossom, which is a Buddhist symbol of purity, since a lotus blossoms in a muddy pond. That is the reason why the nick-name of One Pillar Pagoda is the Lotus Pagoda. During the Ly Dynasty, the temple was the site of an annual royal ceremony on the occasion of Vesak, the birthday of Gautama Buddha. A Buddha-bathing ceremony was held annually on April 8 in the Lunar Calendar by the monarch, and it attracted monks and laymen alike to the ceremony. The monarch would then free a bird, which was followed by the people. However, you will never have chance to see the original version of this pagoda because it was destroyed by French Union force in 1954 during The First Indochina War. After this war, Vietnamese Government decided to re-build this iconic symbol with the same architecture and size. Perfume Pagoda is a very large complex of Buddhist temples which was built into a limestone Mountain – Huong Tich. It is located in Huong Son (Perfume Mountain), 75 km southwest of Hanoi. Because it is located in Perfume Mountain, so most of local people call this complex is Perfume Pagoda and after a long time, now everybody considers this is the real name of this complex. Most of travellers think that Perfume Pagoda is only a pagoda in the mountain but it is a very big complex of many small temples, and shrines. The center part of Perfume Pagoda Complex is “Huong Tich” temple. However the most important part of this central temple is Trong Temple (Inner Temple). It is built deep inside Huong Tich Cave, so local people call it with the simple name – Inner Temple. This is the main part of Perfume Pagoda Complex and there are many local tourists will visit during Lunar New Year to pray for health and luck. Besides, Perfume Pagoda Festival will start from 6 Jan to the end of March (Lunar calendar), so you should not visit Perfume Pagoda Complex during this time every year. Please to check the calendar and itinerary carefully if you do not want to have bad experiences on traffic jam, the expensive for every service there and especially you may be stuck between thousands of local people. Believe me! It will be a very horrible experience, despite I am real Vietnamese. It look like pilgrimage with thousands Buddhists. I will give you a quick brief about history of this complex. On the first there is only one Temple name as Huong Son Thien Tru Pha which nowadays, we call Huong Tich temple , was built during the reign of Le Chinh Hoa (1680-1705). On his way to search for enlightenment, he met and followed a monk who help him build Huong Tich Temple after that. Other shrines and temples were later built in this area to take advantage of the local beautiful scenery. Perfume pagoda has a long history in Vietnamese literature. This temple has been a theme of many songs, topic of poetry, used in literary works as well as backdrops for paintings. Now, you can go up by cable cabin to reach the top and go down by trekking to watch the beautiful view of river and Perfume Mountain. In case you do not have enough energy, you can use cable cabin for both up and down ways. In Halong city, you just hear about Halong bay or Bai Tu Long bay which there are many luxury cruises for tourists to visit these famous bays. Howver, in Halong, there are many other attractions and Yen Tu Pagoda is one of them. Yen Tu region is well-known worldwide for its beautiful landscapes, historical relics and hundreds of ancient pagodas and towers, especially Bronze Pagoda, with its peak at 1,068 meters above sea level. This pagoda is famous and more popular after King Tran Nhan Tong devoted his life as a Buddhist monk in Yen Tu after his abdication. You can visit this pagoda in the afternoon after visit Trang An by local wooden boat. The total complex of this Bai Dinh is very large, so you can rent electric cars with around USD5 per person to visit all of must-see attractions inside. Located in Mekong River Delta of Southern Vietnam, approximately 135km from Saigon, Vinh Long province is now easily accessible by car via the National Road 1A and the My Thuan Bridge.Let’s join with us in one day tour in Vinh Long to see what this province offers. After 2 hours driving from the center of Saigon, we reached to the pier and embarked on a cruise. Our tour guide was a very friendly woman in the traditional costume a – the “ba ba” shirt and the traditional hat. Our cruise took us to visit the brick kilns. It was a small factory but without machinery. 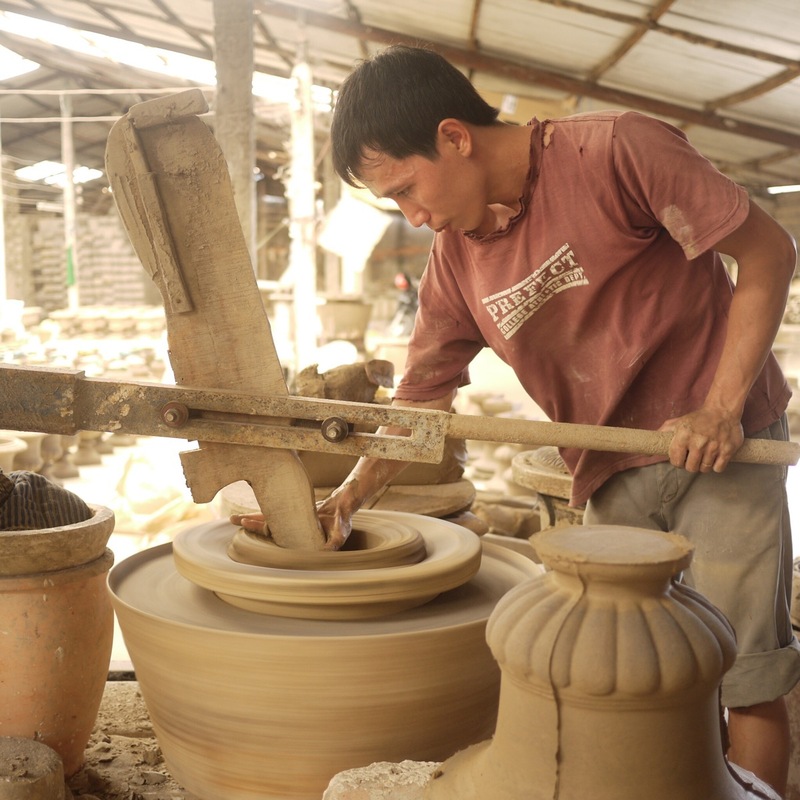 The local people was creating beautiful potteries from clay by their own hands. We were surprised at how manually way they were doing cause it’s the 21st century already! This man is focusing on making the pottery We came back to the boat and continue the trip by visiting a local workshop, where many local products were producing every day. 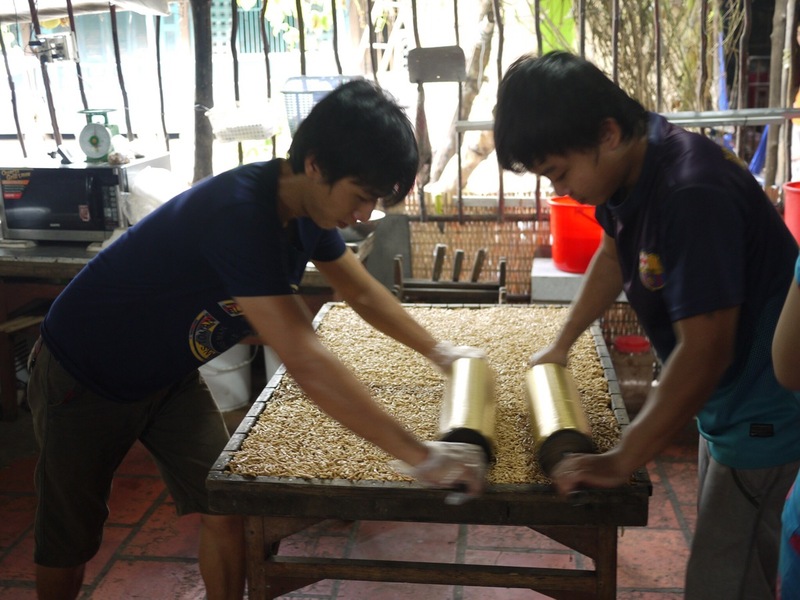 Seeing how the coconut candy is made and try doing the rice paper by ourself. At first, we thought it was very easy to make, but it is always easier to look than done. It requires lots of technique and experience to make perfect products and the woman who made these things are really artists. We also had the chance to see how they make the pop rice and popcorn by a traditional way with a big hot pot and the special kind of sands. All were done beautifully and followed a smooth procedure. We enjoyed some kinds of candies and a cup of hot tea prepared by the friendly local people. The boat took us to visit the orchard and traditional house of Ut Trinh family. We had a tasty lunch made with fresh local ingredients. After that, we enjoyed some kinds of fresh seasonal fruits when listening to the traditional music of local people. We then walked around the orchard to see the varieties of tropical fruits such as the jackfruit, durian, rambutan, mango, etc. In the afternoon, we passed on a small rowing boat – as known as the sampan to go deeper into the countryside on smaller canals and enjoy a peaceful time. 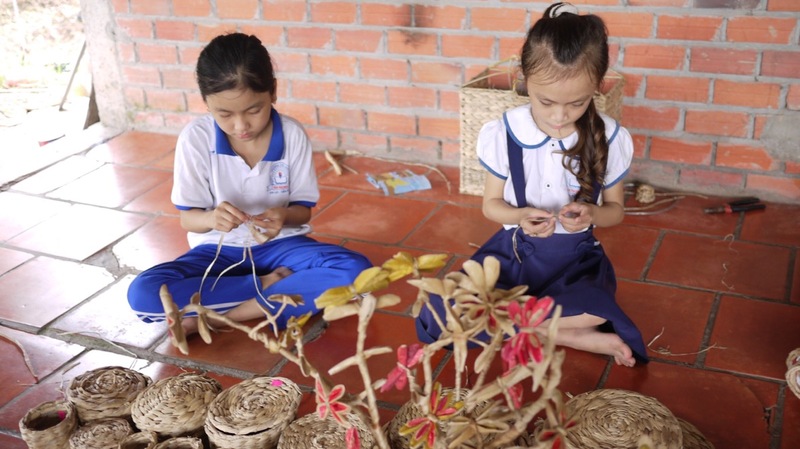 It was so interesting to see traditional houses made of wood or palm tree leaves and see some activities of the local farmers, see how they picked up fruits by ancestral ways in Mekong Delta. The last activity of the trip is biking! We biked on the small roads around the orchard, yellow flowers were blooming on the way and there were some fruits hanging right above our heads! What a peaceful time! On the way, we passed a school and saw the children were playing at their break time playing some traditional games. It seemed like this place hasn’t been affected by the technology, the smartphones and social network. We back to the cruise and headed to Vinh Long city, where our car was waiting to take us back to Saigon. What an interesting day with many new things to see and do in Vinh Long! West Lake is the biggest lake – the air conditioner of Hanoi with cool and windy weather. With the diameter of approximately 17km, this is the most favorite place of coureur from professionals to amateurs or to anyone who loves the idea of biking along the peaceful lake. In the early morning or late afternoon, this lake becomes more crowded as people here, especially couples, are keen on seeing sunrise/sunset. As the lake is really wide, you will have a totally panorama view of the scene where the sun is nearly going up/down. Besides, the extreme highlight of this route is the lotus season. Located near to the West Lake water-park is a 5 ha lotus field which blossom every June – July. The fresh scent of lotus and lotus tea will make your day more energetic. Lotus tea – one of the most elegant and sophisticated teas in Vietnam – is a specialty only served in the west lake where nowhere could ever compare. The tea is made by allowing the green tea to absorb the flower’s natural fragrance. This is done through several methods, but the most knowingly is stuffing green tea leaves into a flower and leaving them overnight. The Sword lake is the symbol of Hanoi which makes it the must-not-miss site. Normally, this place is always full of people who are walking or joining in cyclo, but how special it is to ride a bike and combine both the sword lake with the 36 old streets. In the early morning, a lot of local elder people come here to practice, do some light physical exercises and walking around this lake for 2-3 rounds. This is a very local experience beside Ngoc Son Temple, The Huc Bridge or the Turtle tower and lots of green old tree. For the Old quarter, if you can visit here early in the morning when not so many stores and stalls are opened, you will feel the tranquility, see the old architectural houses with yellow outer walls, green wooden windows, or surprisingly Ta Hien street with no one which is totally different with the night Ta Hien street – very noisy with tons of people. Living in Hanoi for more than 20 years, I myself have to admit that there are a lot of places here I have not reached to but I know, Hanoi is always there waiting for me to feel it by my own way, special way. Should I visit Sapa in summer? Located at the North West mountainous area of Vietnam, at a high altitude of 1600 meters comparing to the sea level and 380 kilometers away from Hanoi, this is an ideal location for summer retreat with pleasant climate and fresh atmosphere. The average of temperature in Sapa town is only approximately 15 degree Celcius in which there are two warmest months: July & August when the temperature can reach up to 29.4 degree Celcius for day time. While the winter in Sapa is getting colder with fog and drizzle all day even some years with heavy snow falls at the highest peak, the summer in Sapa witnesses sunny days and cool nights at a very relatively stable temperature. Therefore, it is certain that summer is the perfect time for photos hunters and trekking lovers. However, summer is also the rainy season so sometimes of the day so this unfavorable condition of hot, humid and wet may hinder your enjoying fresh air and strolling around this lovely town. The only way to continue with your trip is to be well prepared for these sudden and infrequent showers. Thanks to its nature, the growth of diversified sauna & fauna make Sapa a distinctive and breathtaking beauty. This period can be divided in to 2 different parts: The first part is from May to end of July when it is time for the ethnic to grow rice terrace along the hills. You will be surprised by the whole valleys covered with lush and green color of rice. The vivid and lively pictures can’t be completed without the image of hard-working buffalos pulling plough across the terraces under the instruction of the tribal people. The second part is the August until early October when the terraced fields change seasonally to gold color when being ready to be harvested under the sunshine and this is the most satisfying scenery that any tourists traveling to Sapa must see at least once in their lifetime. On this occasion, tourists may also be awed by beauty of blooming colorful flowers along the slopes and down the valleys. Summer is the season of pensées flowers, the flowers of love and nostalgia. The cherry, pear, peach and plum also go into harvest time with juicy fruits. These can be a little sour but fresh taste and soft fragrant can relieve any tourists during hot days of summer. The must see sites during your visit this period of time are: Ta Van village, Muong Hoa Valley, Ta Phin village and Ham Rong Mountain where you can enjoy the spectacular scenery and lovely surrounding countryside and tribal villages. As the summer is quite cool, you can totally wear shorts, T-shirts and thin clothes but do not forget to bring a light jacket when hanging out at night or climbing up to the summit of mountain, Fanxipan for instance. A raincoat, umbrella is needed in case weather change. And it is great to have a scarf with you regardless of warm weather or cold weather because it can be multi-functional than you know. If you love trekking, a pair of proper walking or trekking shoes is a must not miss so that you can feel free to wander around the town for the whole day or go uphill and downhill into the tribal village. The chance of photos during summer is unlimited so this will be an excellent time for your passion of photo taking. Rechargeable battery is also an evitable stuff to bring along so that you will never feel regret of not having enough power for keeping all of stunning moments. Due to the long walking outdoor, a few of snacks, milk or candies will be great to “charge” yourself while doing trekking or finding a resting place for food and drink. If you meet the lovely children on the route, these candies can be nice gifts for them but these can be easily bought in Sapa so there is no need to bring from Hanoi. Who’ve ever been to Angkor Wat and Angkor Thom must be overwhelmed by the enormous scales and the extraordinary architect, along with the sophisticated sculpture on the stone wall. Thousands of stories are being told by the skillful hands of people in centuries in the past. And it’s not too hard to recognize the picture of the people with special posture, wearing unique costume and accessories. They’re dancing on the wall, called Apsara. Apsara dance’s existence is known since 6th-7th centuries. The Javayarman VII King (most famous Khmer King of the Angkorian period), supposed to have thousands of dancers in his courts. During the Khmer Rouge regime (aka the Pol Pot’s genocide, a dark past in the Cambodia’s history, many artists had to leave the country or being arrested, tortured and killed. After the fall of the regime in 1979, the country wanted to revive the traditional arts, although at the same time people had to deal with many other challenges, thanks to a few surviving dancers who passed on their knowledge to young generations. 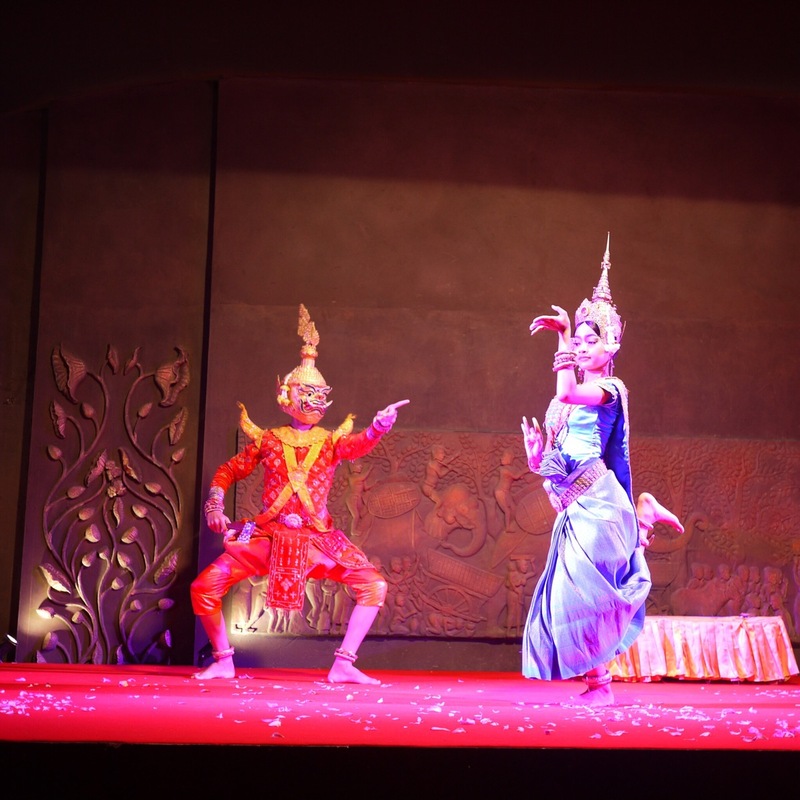 Apsara dance was traditionally performed only for the King, but now it is performed public for everyone and become a famous show attract tourists. Though, the most important facet of traditional classical dance is still performed as a part of certain sacred ceremonies and award presentations in modern Apsara. The dancers’ costume is recognized for its ornate costumes and headpieces. The costume is made of many of the silk drapings, which is called sampot sarabap in the Khmer language, in different colors. The headpiece of the lead dancer’s always be made in a brighter shade to highlight her with the others. There are some accessories the dancers usually wear like a choker, red or golden collar necklace, decorated with designs and copper adornments, are worn in addition to long earrings modeled after the krorsang flower. As the Apsara dance focus very detail in each movement of the dancer’s body part, especially the gesture of hands, fingers, and feet, the dancers wear very big bracelets around their wrists and ankles. They will slide elegantly and clink together during the performance when the dancers move. The sangvar, which can either be worn as a belt or carried on its own, is made of lightweight copper and decorated with golden and red floral designs. Every single movement of the fingers has a particular meaning, worship the spirits of nature by depicting a blossoming flower or refer to the hundreds of legends of Buddhism or Hinduism. 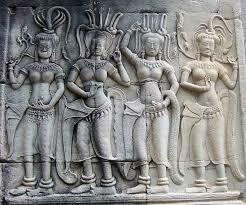 The dance is display for the different religions which Cambodia had been built upon ( Animism, Hinduism, and Buddhism). The stories are told via the Apsara dance often depicted in the carvings of Angkor Wat with four primary roles: the male, the female, the giant and the monkey (usually played by a male dancer). Although traditionally, male dancers do play certain roles in Apsara dance, today the art is practiced and performed mostly by women. The movement of the dance is extremely complex, thus the children (particularly girls) must be trained since they’re very young, so they can get enough skills and flexibility to execute intricate movements and bend their fingers like a flower. 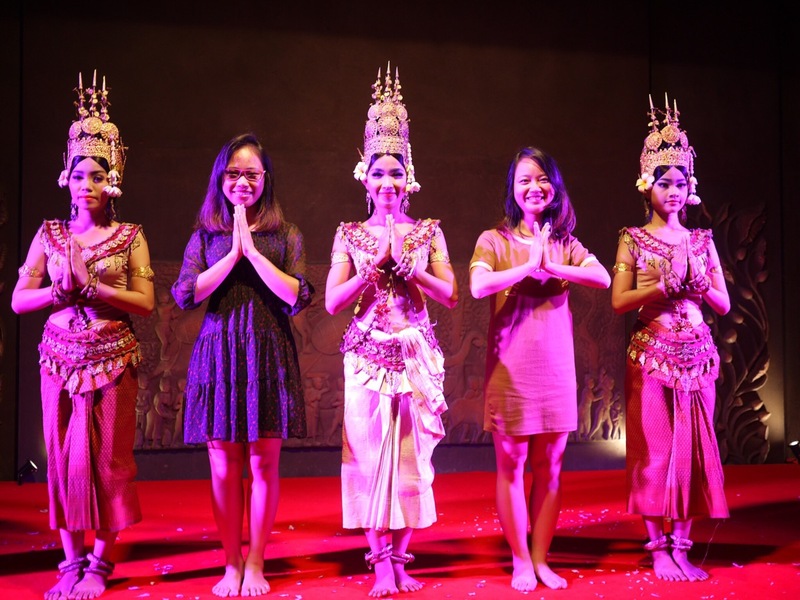 Where is the show in Siem Reap?